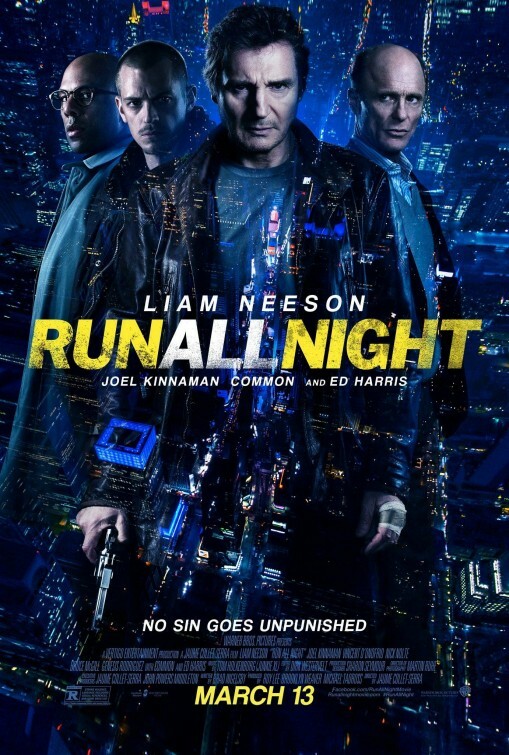 “Run All Night” is the third action flick teaming Liam Neeson with Spanish director Juame Collet-Serra after the absurd “Unknown” and the mid-air thriller “Non-Stop”. Both of those movies were looked at as “Yet Another Liam Neeson Action Movie”, a perception moviegoers have understandably adopted ever since “Taken”. His late career move to the action genre, has kind of written off Neeson as that guy who shows up with “a very special set of skills” – but last year’s “A Walk Among the Tombstones” showed that the characters he plays in the movies he headlines aren’t interchangeable. So, fans of Neeson can rest easy, he’s not on his way to becoming the next Steven Seagal. In “Run All Night”, he actually plays one of his least sympathetic characters yet. So, despite the movie’s title (one would expect Tom Cruise to star) and the trailers and TV spots making sure to emphasize that Warner Bros. is offering “more of the same” from Neeson, what we see from the actor is quite different from what we expect. That’s not to say the movie is full of surprises. Jimmy Conlon (Liam Neeson) is a hollow shell of the man he used to be, drinking away the man he wished he was while being tormented by many sins. Over the years, he’s racked up quite a long hit list as an assassin or “The Gravedigger” for his childhood pal, Shawn Maguire (Ed Harris), a New York City mob boss who’s supposedly gone legitimate. Jimmy’s jobs found him ending the lives of friends and family, leaving him alone in a cold apartment with a space heater, taking handouts and odd (often humiliating) jobs from Maguire’s arrogant son Danny (Boyd Holbrook). Jimmy also has a son, Mike (Joel Kinnaman), who wants nothing to do with his father on account that he left him and his mother years ago. Mike and his wife Gabriela (Genesis Rodriguez) are trying to raise their young daughters far away from the shadow of his father. In fact, having not spoken to his father in five years, Mike has never even introduced Jimmy to his family. Regardless, Jimmy has kept tabs on his son, knowing that the former boxer spends time mentoring neighborhood boys in the local gym and spends his nights as a limo driver. A gig that lead all four of these men to one specific fateful night. Now based on what I’ve told you, there seems to be potential for a solid ‘Sins of the Father’ tale here, complete with urban grit and familial resentment and regret. While there is a touch of that, let us not forget the title here. Screenwriter Brad Ingelsby (“Out of the Furnace”, which also explored hard men) has no time for deep characterization and is busy instead with lazy coincidences, stock conflicts and just some flat-out bad plotting. One jarring coincidence is the fact that Mike just so happens to have two Albanian thugs as clients one night. He unknowingly drives them to Danny’s home where they try to collect a debt from the cokehead. While he waits in his limo outside Danny’s home, it just so happens that one of the boys (Aubrey Joseph) he mentors is riding his bike past the limo. Inevitably (we see it coming), both Mike and this boy, nicknamed Legs (appropriate for this movie), witness Danny kill off the Albanians. Now a target, Mike flees after a scuffle and chase with Danny, making it back to his home, grateful that his wife and daughters are at his brother-in-law’s place. It doesn’t take long for Jimmy to find out his son is in trouble. Jimmy arrives at Mike’s place just in time to fatally shoot Danny right before he can kill Mike. 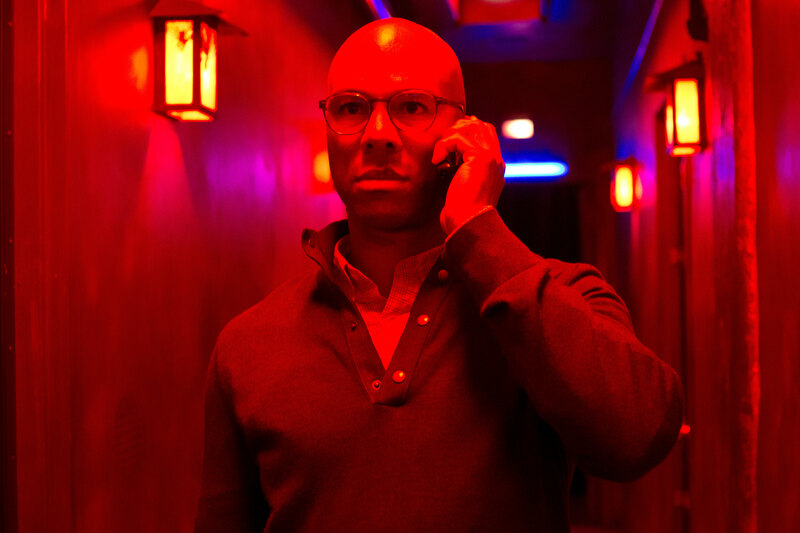 Jimmy makes the call to Shawn and tells his old friend he’s killed his son. As Jimmy expected, Shawn breaks the long-standing bond and vows to use all his resources to take down both Conlon men. This has the two men, running all night, with Mike wanting to make sure his family is safe and Jimmy’s only goal is to keep his son alive. What a father/son reunion. 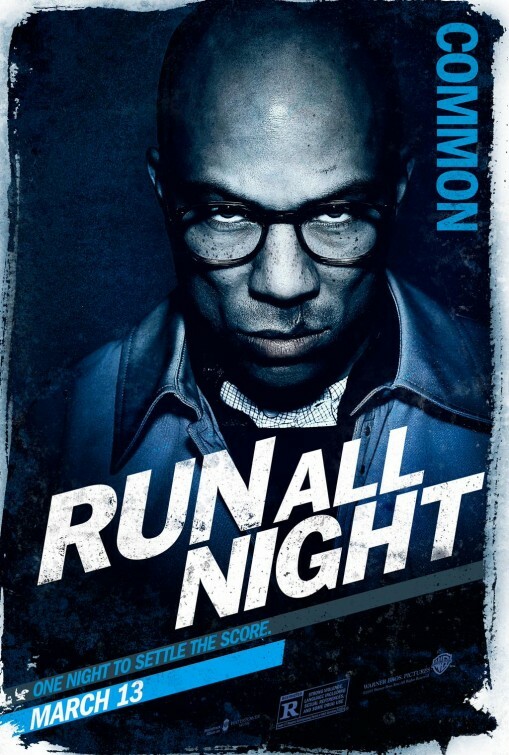 If not for the actors portraying the two sets of fathers and sons, “Run All Night” would be a wholly dismissive movie. That’s mainly due to the combination of the poor narrative structure Ingelsby chooses and the frenzied decisions of director Collect-Serra. For some reason, Ingelsby thought it’d be a good idea to show us the ending and then fill us in with an overused “16 hours earlier approach” that underminds the whole idea of whether or not our protagonists are going to survive their all night run. Then there’s the zoom-in/zoom-out, slo-mo action incorporated throughout the movie, the kind of cinema play you’d find in a video game. There’s really no reason for this obnoxious choice, other than to add a stylish flair to the feature. What winds up happening is a jarring tonal shift in between too many scenes that frustrates and pulls the viewer out of the picture, instead of immersing them in what could potentially be a realistic streetwise crime drama – think James Gray’s “We Own the Night”. But if you’ve become a Neeson action completist, this is an inevitable watch. The best action sequences are the brutal hand to hand combat ones or the kinetic foot chases, but there’s nothing impressive about the car chases that feel like they’re filmed on a Hollywood backlot. 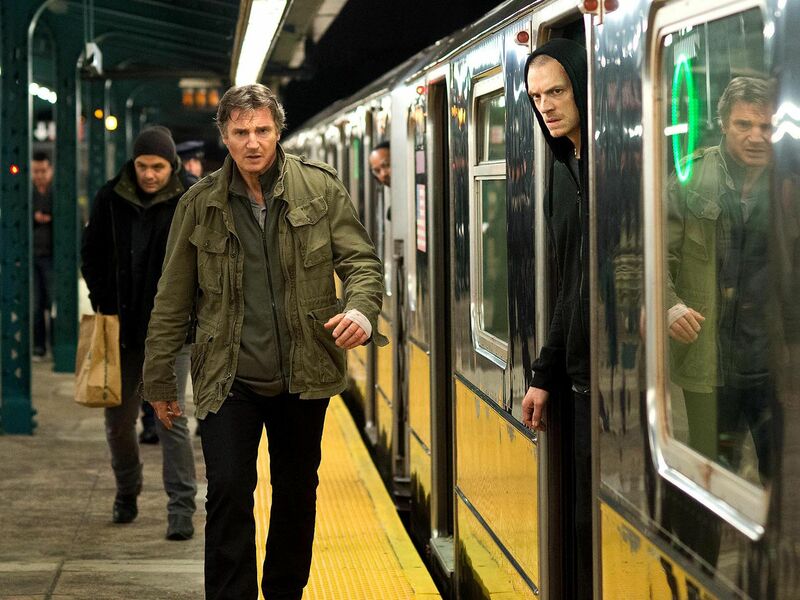 The blunt fight between Neeson and Holt McCallany (slightly less underused here than he was in the recent “Blackhat”) in a subway washroom, involving toilets, sinks and stall walls, is pretty much what you’ve signed up for. There’s also a cool sequence set amid a housing project high-rise where the Conlons are trapped and pursued by a detective (affectively played by Vincent D’Onofrio) and a high-tech hitman named Price (an unintentionally comical-yet-entertaining Common). All of these action scenes are easy to follow and quite thrilling. Still, considering all this action, what reverberates most are the non-action scenes. 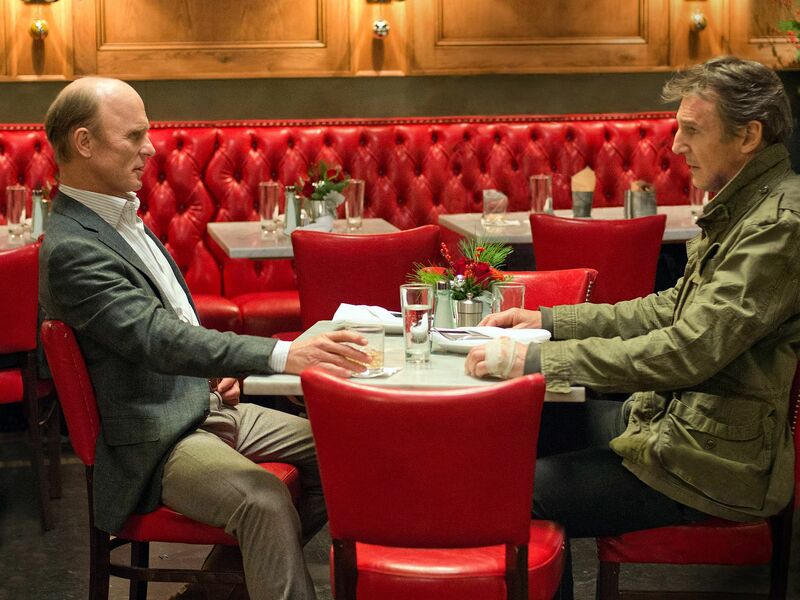 When Neeson’s Jimmy and Harris’ Shawn meet-up at one point during the evening, you’ll find yourself wishing the story focused solely on these aging tough guys and the effect their decisions have had on their families. There’s a more compelling story to be told there that this straight-up Hollywood action flick has no patience for.